With more and more museums pushing content to personal digital devices, we need to remember who we may be leaving out. When Phil and I talk about the digital divide, we are usually thinking of an economic barrier—the shrinking (but significant) portion of society that does not have access to mobile technology, particularly smart mobile technology. But apps and other digital content can pose accessibility challenges as well. Museums have a mixed record on making even their websites meet accessibility standards—often unintentionally throwing up a “digital glass wall” that hinders access. How will we fare with the myriad content being developed for apps, podcasts, etc? For this reason, we’ve kept our eyes open for news related to universal design and digital devices, as well as our ongoing scanning on accessibility in general. Pesky People, a UK-based group that, among other campaigns, advocates for the cultural sector to subtitle their video content. 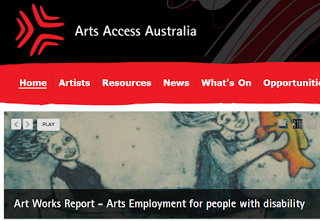 Arts Access Australia is that country’s leading advocacy group for arts and disability, with an extensive resource list. The Tucson Association of Museums, which maintains a convenient listof agencies, information and products for the visually impaired. Comprehensive efforts by the Boston Museum of Science to incorporate the principles of Universal Design into their work. The Israeli Children’s Museum working to increase empathy for the limitations that come with aging. The Royal Ontario Museum including lots of touchable casts in Maya: Secrets of Their Ancient World. The Manchester Museum pioneering the use of haptic technology in their galleries. The nine other UK museums associated with Rethinking Disability Representation in Museums and Galleries, a research initiative based at the University of Leicester. Dyslexia Style Guide for writing and web design. DeafSpace Guidelines produced by Gallaudet University. Recent report from the Accessible Technologies in Museums research group at Spain’s Carlos III University about their international survey of museum professionals on accessibility. Disability Meets Digital Unconference in Manchester, UK, on Thursday, March 21 (if you go, please volunteer to write a guest post about it for CFM). W3C Guidelines for web accessibility. A growing list of resources from Creating Museum Media for Everyone. This Malaysian research paper on Integrating Elderly Pathway Design into Museum Space Planning (not as obscure as it sounds, and applicable to other kinds of mobility restrictions as well). Finally, for a more scholarly and theoretical approach, Helen Rees Leahy’s book, Museum Bodies: The Politics and Practices of Visiting and Viewing (Ashgate, 2012) offers some historical perspective on how museums have accommodated or excluded people with disabilities. H-Disability is an academic discussion list devoted to disability studies, including reviews of the emerging scholarship on disability and museums. Please help us keep our museums & accessibility resource list up-to-date by sharing links to articles, websites and other resources in the comments section below. Thank you! Thanks for the roundup without tears and too much text.